Apropos Of Something hosts Ellen Daniels and Nancy Laurence talk with Michael D. Williams MD, Assoc. Professor of Surgery and Director, The UVA Center for Health Policy, on remedying bias in our healthcare system; and Brendan Wolfe, noted author, essayist, editor, on his latest book, Mr. Jefferson’s Telescope, as well as his love of history. 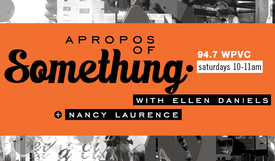 Apropos Of Something hosts Ellen Daniels and Nancy Laurence talk with Shilpa Dave PhD, Asst. Professor, Media Studies and American Studies, Asst. Dean, College of Arts & Sciences on diversity’s inroads into American pop culture; and Michael D. Williams MD, Assoc. Professor of Surgery, Dir., The UVA Center for Health Policy, on achieving health equity on a global scale.